The Beadful Life @ BeadFX: Dirty is, as dirty does! I’ve started experimenting with “dirty pours”, and I think that I’m in love!!!! They're so much fun, that I’m sure it will become yet another fascinating addiction for me (heh, heh, and perhaps for a few others)! ! 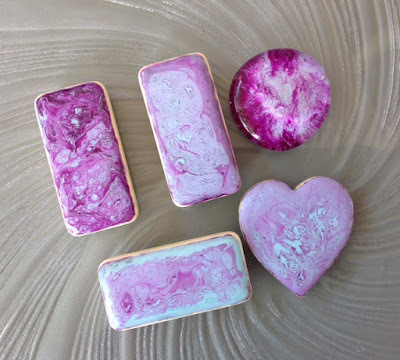 As I mentioned in an earlier blog post, you could use either resin or acrylic pouring medium, as the base of your pours. 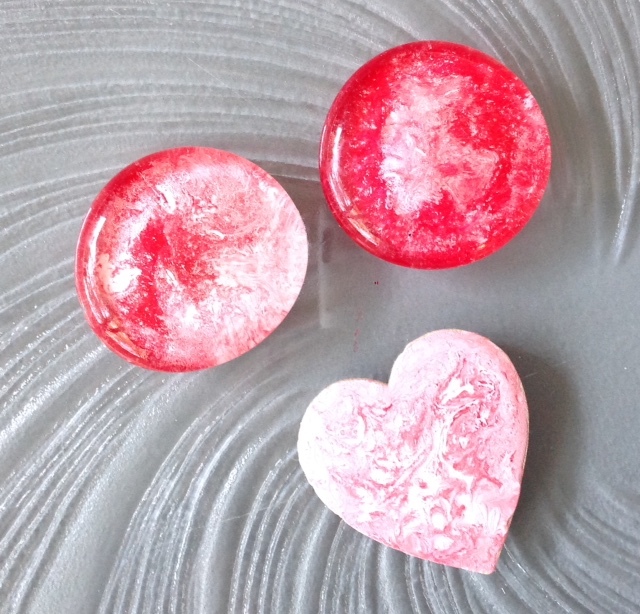 I used pouring medium this week, but I do promise to work with Ice Resin next time. The small measuring cups were overkill, as no measuring was required with the pouring medium, but you will need to remember to use them when working with resin! If you ask me how I did this, I’ll need to give you a sketchy answer, as this is definitely not a scientific process. 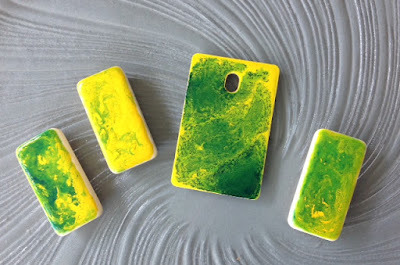 I’ve found that it’s impossible to duplicate pours, even when working with the same batch of paint. I splash in a little pouring medium, then add dollops, or drops of paint and ink. For the purpose of these experiments, I used acrylic craft paint, acrylic ink, high flow acrylic, and alcohol inks, but not all in the same batch. The pouring medium goes first, then paints and inks, from heaviest/thickest, to lightest/most liquid (on the top). 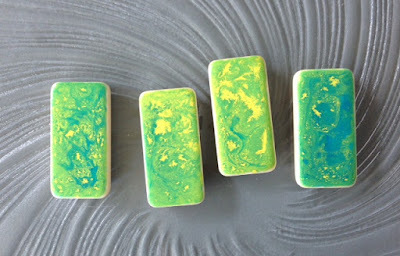 Alcohol inks, if you’re using them in the mix, go in last. A quick swish with a toothpick (you do not want to mix thoroughly), then you’re ready to pour. I chose to use four different substrates for this first go! Domino game pieces, glass nuggets (thanks Malliga), laminate countertop samples (courtesy of my local home improvement store), and a couple of little wooden hearts (thanks Pam). No real reason for choosing them, other than that’s what I had on hand. 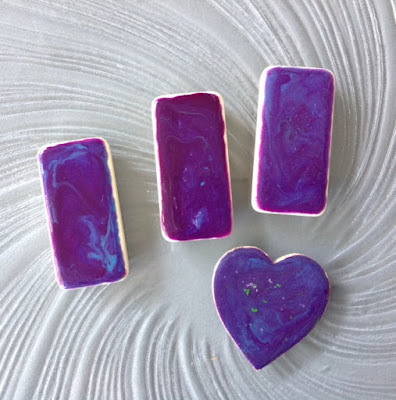 I intend to pour my next series, onto metal blanks and glass tiles (available at BeadFX). My process still needs refinement, but I started by pouring a line of the paint mixture, in the middle of my substrate. It’s fairly thick, so it was easy to spread to the edges, via my very sophisticated, toothpick tool! If you try this on your own, be careful not to over pour, as you will make quite a mess, and end up with a puddle of paint, flowing over the edges. In a true “dirty pour”, you pick up the edges, and rock the substrate back and forth, until you're happy with the results. I didn’t have gloves, so I decided to leave that technique for another day. You’ll notice from the photos (each represents one batch of “dirty pour” paint), that the colouring for each batch is the same, but the patterning is completely different. The layering of the different densities of paint, as it comes out of the pour, is like magic! You can also do another pour, on top of one that you weren’t entirely happy with, but let it dry first. Take the dark purple set, for example. They looked okay in the photo, but I decided that I really didn't like the results, so I mixed up a lighter batch, and changed the look entirely (see below). Plus I was able to add an extra piece, as a bonus! I also tried splashing on alcohol inks, after the pour, for yet another look. However, you need to hold your breath, and hope for the best, as this causes a drastic change to the look of your pour!! All of these pieces are destined to be pendants and cabochons. They'll get a top coat of Ice Resin, but I still need to figure out how I’m going to finish the backs and edges. I do have ideas, but would like to try them out first, before revealing all of my secrets. After all, I am participating in the BeadFX, Artisan Trunk Show, on October 2nd! I do promise to take photos, and will show them in a future blog post! Go forth and be dirty, my friends! My apologies in advance, if I’ve tempted you with a new technique/addiction!! !